Intense sunlight, searing heat and high exposure to dust; solar modules in the desert are exposed to different climate conditions than those in Germany. An interesting challenge for the solar researchers at the Fraunhofer CSP in Halle. As cooperation partners to the Moroccan research institute IRESEN, they have developed a photovoltaic test park which has been built near Marrakesh. The scientists can now evaluate how the solar modules will age in the desert in real time. At the end of the stairs to the roof of the Fraunhofer Centre for Silicon Photovoltaics is a notice board. Everyone accessing the roof has to write down their name and the times that they come and go. "Shade can disrupt the measurement results in our testing area. We can filter it out, though," explains Matthias Ebert, the lead scientist of the working group for the "reliability of solar modules and systems" at the Fraunhofer Center for Silicon-Photovoltaics CSP in Halle, Saxony-Anhalt. His team of researchers focuses on the material science based analysis of solar modules, carries out mechanical and thermo-mechanical experiments in the laboratory and in the field, and analyses the measurement data with the goal of optimising and further developing the modules as well as their technological manufacturing processes. This is because ensuring a high level of reliability, a long lifespan and the best possible output - at costs that are as low as possible - are the challenges for the solar sector in the entire world market. There are 30 measuring stations on the roof of the research centre in Halle which catch the light that falls on the city on the river Saale. Ebert tells us how it is wrongly assumed that the light irradiation is more intense in countries further to the south. It totals a maximum of 1,000W/m2 all over the world, there is just a lot more sunlight in countries further to the south. "The measuring stations on our CSP roof are comparable with the identical ones in Morocco," explains the graduate of civil engineering, telling us that the “Green Energy Park" is situated in a rocky desert near Marrakesh. It was co-developed and constructed by scientists from the Fraunhofer CSP in 2015. "Green energy has become a major topic in Morocco. The country doesn't have any gas or oil - but it does have plenty of sun and wind," says Ebert. He has visited Morocco four times as part of his cooperation with the Institut de Recherche en Energie Solaire et Energies Nouvelles (IRESEN) in Morocco. Its director, Badr Ikken, lived in Berlin for 17 years. He knows the solar industry in Germany well and values the Halle research centre as a competent partner with whom his institute wants to advance the use of renewable energy in Morocco. The cooperation agreement between the Fraunhofer CSP in Halle and IRESEN in Rabat has been going since 2012. The initial intention was the development of a test platform for photovoltaic modules and system. "The test platform looks like this one here," Matthias Ebert swings his arm over the solar modules on the roof. "The photovoltaic park in Morocco is much bigger though and the biggest in Africa. And it is of interest to manufacturers of solar modules worldwide. You can test the yield potential of your modules under the extreme climate conditions of the African desert," adds the scientist, naming soiling due to sand storms or changed material attributes to extreme heat and temperature variations between the day and night. 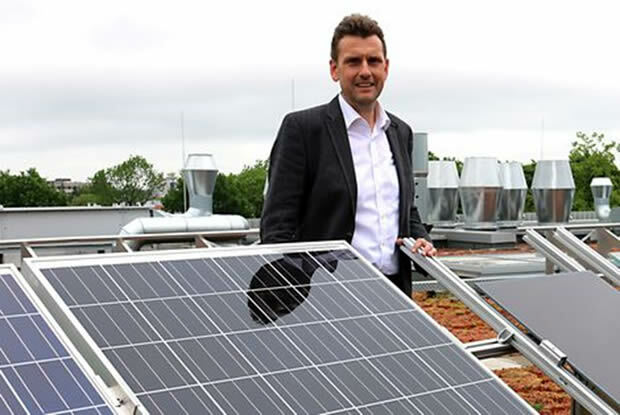 Image caption: Dr. Matthias Ebert shows the solar measuring stations on the roof of the Fraunhofer CSP in Halle. They are identical to those in the "Green Energy Park" in Morocco and enable a direct comparison of the measured data. In 2016, the cooperating partners are moving from the research phase to the construction phase. "Depending on the weather, the modules in Africa can bring in twice the yields as those in Germany. A decisive factor, however, is whether they can also guarantee the 25-year lifespan guaranteed by the manufacturers there. "Temperatures of over 70˚C for example affect the modules," explains the scientist. Results from load and ageing tests in the laboratory can now be supplemented with real time measurements under the location-dependent influences of the sunlight, atmosphere, wind, precipitation, temperature, and soiling. The key focus of the project between the Fraunhofer CSP and IRESEN is the ageing of materials and the performance of the solar modules when soiled. "We transfer our expertise to Morocco in workshops and training courses, where the applied research is currently developing well," explains Ebert. One goal of the partnership between Germany and Morocco is to connect the photovoltaic systems with desalination units for the treatment of drinking water. "And of course, the storage technologies for photovoltaic systems in the desert are also interesting," adds the solar researcher. This is an area on which the CSP is going to focus more of its research: converting wind and solar energy into storage-capable hydrogen. Is concentrating solar power still alive?